It’s cyberpunk reimagined—science fiction meets the detective thriller in an ever-rainy world of colossal skyscrapers. Hovercars fly above in the dark, bustling skies and gray people walk below on the grimy, flashy streets of this “neon jungle.” Metropolis isn’t a bad place, but it isn’t a good one either. Uber-governments and megacorporations fight for control of the supercity, but so does crime. We meet Cruz, our private eye (and unlikely hero), in a supercity with a million victims and perpetrators. 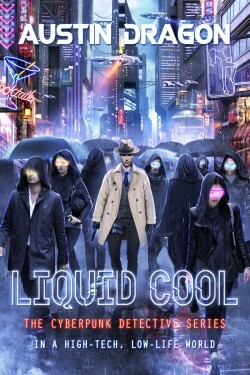 Welcome to the high-tech, low-life world of Liquid Cool. But BLADE GUNNER is a Christmas novel! Sinister secret megacorporations. Savage Cyborg cults. And the Blade Gunner. How does Cruz, our private eye (and unlikely hero), solve this case—let alone survive? 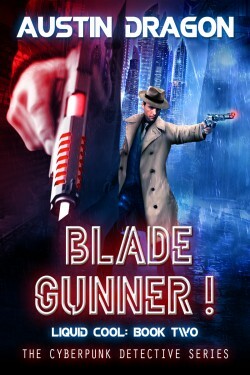 Off-worlders will do anything to stop the unknown man called Blade Gunner—even to blow up a supercity from space!